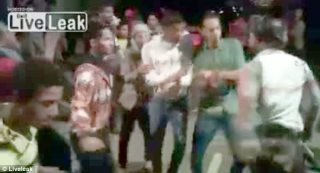 AFRICANGLOBE – A Yemeni wedding ended in disaster after a guest firing celebratory shots in the air with his AK-47 accidentally killed two men while they were dancing to song “Gangnam Style”, according to a police source and a video posted online. The police source said the guest at the wedding in the southern city of Taiz lost control of his rifle, leading to the deaths. Two other people were being treated in hospital. A video circulating on the web purportedly shows the incident, which happened late last week. Its authenticity could not be immediately verified. The footage shows a man shooting a gun in the air and then starting to dance with several other guests to Gangnam Style, a song by Korean artist, Psy. The rattle of gunfire is then heard and when the camera pans down, bodies are seen lying in pools of blood. The music stops as the guests rush to help the victims.